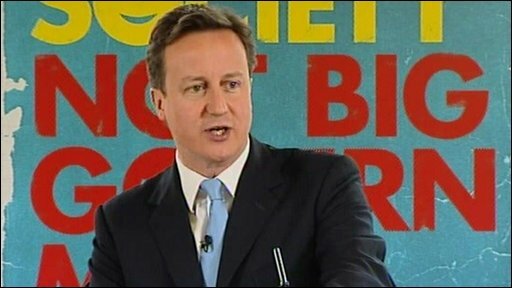 David Cameron: "People are skeptical that change can happen"
David Cameron has said that a Conservative government would train a 5,000-strong "neighbourhood army" to set up community groups. The Tory leader said in a speech this offered a "positive alternative to Labour's big government" approach. But the BBC has learned it will be paid for with money from an existing scheme which supports voluntary organisations. Meanwhile, Labour is promising communities more powers to take over the running of local services. The parties are attempting to take control of the "localist" agenda ahead of the general election, which is likely to be held on 6 May. The Conservatives are promising to fund the training of 5,000 full-time, professional community organisers "over the course of the next Parliament". They say this is based on a movement in the United States which has "trained generations of community organisers, including President Obama". BBC political correspondent Carole Walker said the funding would come from Futurebuilders, a government programme which provides grants and loans to charities and other voluntary bodies to help them bid for and deliver public service contracts. Mr Cameron has pointed out that Futurebuilders has been criticised, in the past, for poor delivery. But a report by Sheffield Hallam University published on Wednesday concluded the scheme had provided organisations with access to finance they would not otherwise have got and, in the majority of cases, they had delivered services more cost-effectively. In a speech in central London, Mr Cameron said: "I don't think the state should be funding directly the community organisations, but the state can fund the training, can do some of the galvanising." Repeating his description of Britain as a "broken society", he said: "We are determined to create a bigger society, to give people more control over their lives. We believe we need to get Britain running." Mr Cameron also announced plans to create a "Big Society Bank", funded from unclaimed bank assets, which will "provide hundreds of millions of pounds of new finance for neighbourhood groups, charities, social enterprises and other non-governmental bodies". The party says it will transform the civil service into a "civic service", by "making regular community service a key element in civil servant staff appraisals". Mr Cameron said: "In Labour's world, for every problem there's a government solution, for every issue an initiative. "This is not what Beveridge dreamed of when he created the welfare state." He added: "We want every adult to be a member of an active neighbourhood group. "I know some people argue that there isn't the appetite for this sort of widespread community participation. I don't agree." For Labour, Cabinet Office Minister Tessa Jowell said a pilot scheme would look at giving parents a greater role in deciding how Sure Start children's centres are run. There would also be a "movement to allowing staff in the NHS who want to run their own services to keep their existing pension". Ms Jowell said: "The era of top-down government is over. Often, the best people to decide how local services should work are the local people using and running those services. "These measures are an important step in achieving a big increase in the number of 'mutual' services that will give real power over the services that matter most." The Liberal Democrats said the Conservative proposals were a "gimmick" and they were "out of touch" with existing examples of community activism. "The 'Big Society' is just patronising nonsense, particularly for the thousands of dedicated people who are working to make their communities better every day," said the party's communities spokeswoman Julia Goldsworthy. "David Cameron will say anything to get a headline. The Liberal Democrats will give people real power over things that matter like their local police and health services." The BBC's Home Affairs Editor Mark Easton said the Conservatives' grass-roots initiative was ambitious and there was a danger it would be easier to put forward in opposition than implement in government.